Enjoy your spirits in high style with this set of two Diamond Glasses. Each tumbler is designed to resemble a diamond's cubic crystal structure, whose beauty and sparkle has fascinated mankind since the dawn of time. When placed on a surface, the glasses will comfortably rest on a flat edge of the diamond-like structure. And when in the hand, the glasses will make you look straight-up classy. Try letting it rock back in forth in your hand or on a tabletop to unlock the aromas of your favorite liquor. Pour yourself some 100-year-old scotch or some bottom-shelf bourbon; either way, you will feel like a million bucks drinking from a diamond. 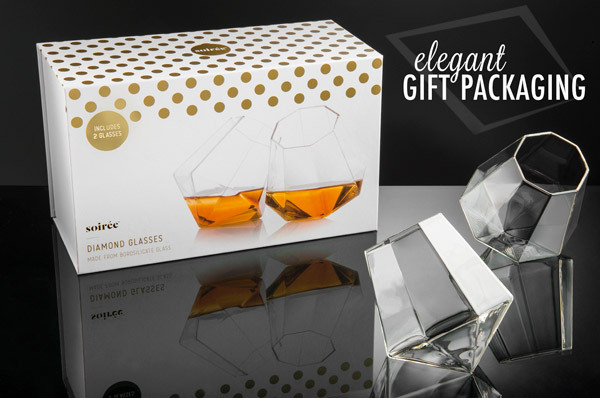 You won’t have to break the bank or get down on one knee to enjoy these diamonds; you just need a good sipping spirit. 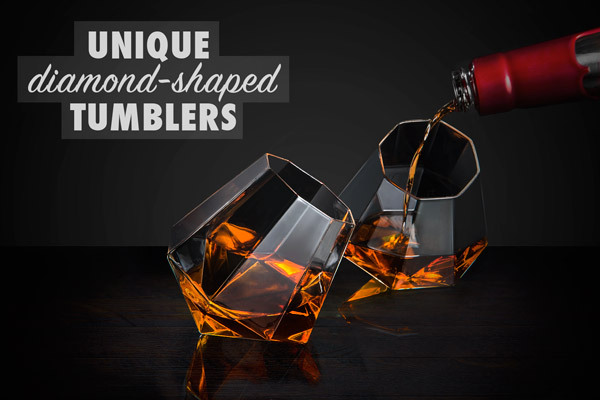 Uncork a favorite whiskey, pour in a couple of fingers, and use your own to grasp the Diamond Glass. Despite its distinctive lean, the unique shape of the tumblers prevents your drink from spilling when you decide to set it down. When you’re presenting someone with a diamond, you’d better make sure it doesn’t come out of a cereal box. 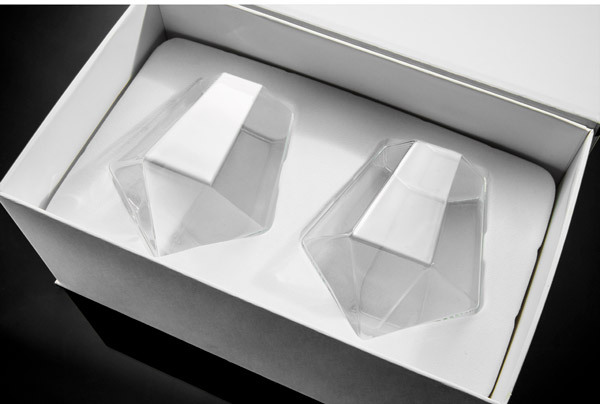 Diamond Glasses are tastefully housed in a high-quality paperboard box that opens and closes with magnetic clasps. Inside the box, the glasses are tucked into a soft, velour-like tray to complete the gift set. Will you toast with me? Question: Diamonds are one of the hardest substances on earth. Will these break if dropped? Answer: While they’re shaped like diamonds, the glasses are made of glass and will likely break if dropped from a significant height. Question: Can I put something other than alcohol in these? Answer: The answer is yes; these glasses obey the laws of physics.